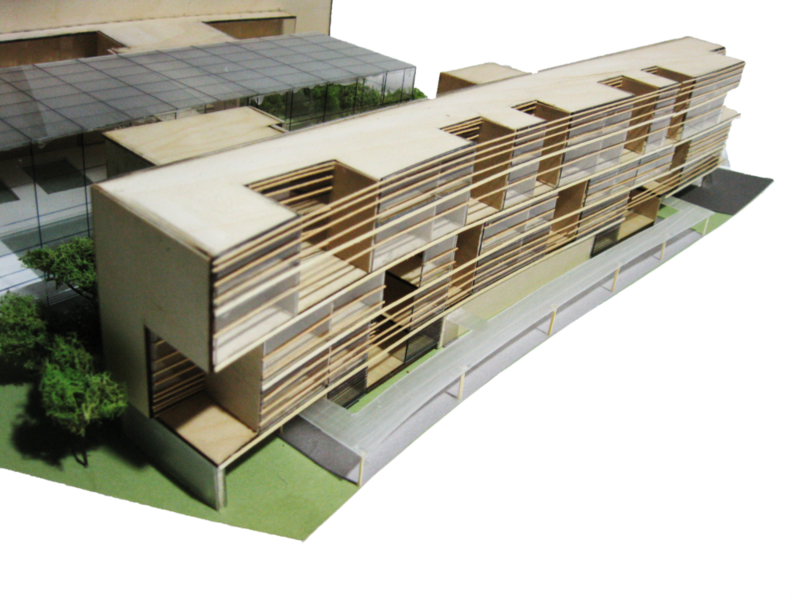 This community oriented residential project created a stratification of spaces with private units on the exterior, shifting to more public programming in the center. This inversion of public/private sectors compared to a typical exterior oriented building was designed to allow for varied interactions. The transition between these degrees of privacy is mediated by circulation zones and shared spaces, as well as a bridge through the community pool area that interjects the private space into the public realm. This gradient of public to private is translated to the facade as well. Private bedrooms on the top and bottom levels use dense horizontal screening, whereas a more open and transparent strategy is applied to living areas. Variation in the apartment layout was used to create exterior space for each unit and allow for a degree of territorialization, pixelating the facade. The site was an extremely important factor in creating the form and orientation of the building. The form has been warped to adapt to the curved trapezoidal site.